It used to be that Niger seldom made the news unless the geographically-challenged confused it for Nigeria, but their blossoming into Africa football’s elite is garnering them lucid attention. The Government of Niger famously introduced a tax on mobile phone usage to help pay for the team’s participation during their Cup of Nations debut last year. The Nigerien Government cited that participation in the tournament would cost them roughly £2.5m, and it simply couldn’t cope with the amount – not when it had other pressing matters to deal with, such as famine. If economic prosperity can tell you a lot about a country’s footballing fortunes, then Niger were poor in their debut appearance. They looked spent as they managed a solitary goal and whilst they didn’t lose by embarrassing margins, the scorelines didn’t depict the general direction of play during their matches. Nigeriens must have felt severely short-changed. This time around the Niger Football Association reportedly held a fundraising event on TV and managed to raise enough money. And that’s not the only laudable action the Niger FA have done. It’s seldom that African football associations get their managerial appointments correct, but their shrewd appointment of Gernot Rohr, who guided co-hosts Gabon to the 2012 Cup of Nations quarter-finals, was pluperfect. Callously, the German coach was not offered a new contract by the Gabon FA, who laughably blamed him for his tactics in Gabon’s penalty kick elimination from the tournament. 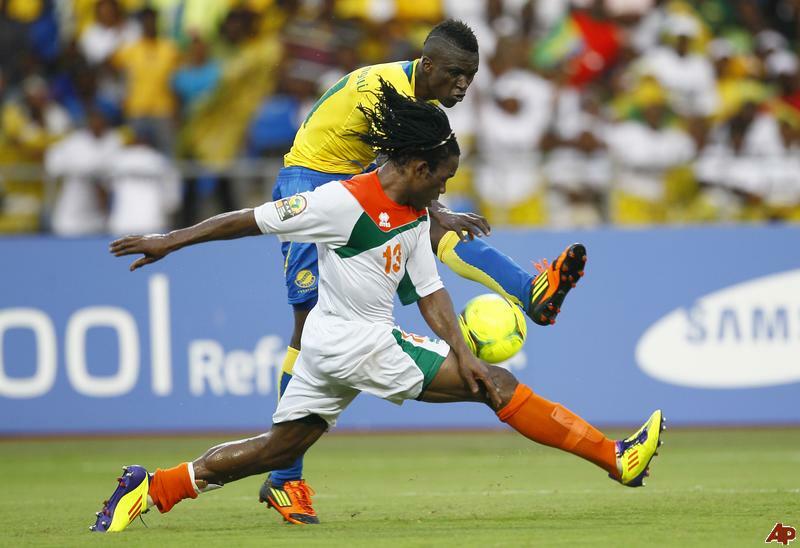 Gabon’s loss has been Niger’s gain; Gabon failed to qualify after losing to Togo whilst Niger Rohred to a win over Guinea. Not many people expected to see Niger back, not least due to their poor performance but also given the haphazard way they made the 2012 tournament in the first place: South Africa’s misunderstanding of what they had to do to ensure qualification. But their play-off win over Guinea, who sport a phalanx of good attacking players, was admirable and the exact sort of giant-overthrowing that Rohr is earning a growing reputation of masterminding. Indeed, bar perhaps Moussa Maazou, who was devastating in the Belgian league circa 2009 for Lokeren, none of the players have made any sort of impact in Europe or even on a continental sphere at club level. Maazou is the shining light of this side and although he isn’t as fruitful as he should be at international level, he is the reference point for the team. Rohr will deploy his usual 4-5-1 system and look to get the ball to the wings as often as possible for swift attacks. The rugged Mohamed Chikoto at his very best. South Africa-based custodian Kassaly Daouda, aged 29, is experienced but the youthful alacrity and lack of know-how in the rest of his defensive force could spell the Menas’ demise. The young centre-backs Mohamed Chikoto and Koffi Dan Kowa play at a decent standard in Tunisia, the former is an intransigent by-any-means-necessary kamikaze defender. They were the defensive comrades last time around and although they displayed astounding naiveté, Chikoto put in a mightily impressive performance against Tunisia. Amadou Kader will probably start at right-back whilst eighteen-year-old Mohamed Sumaila, who understandably looked nervy in the last edition, returns. 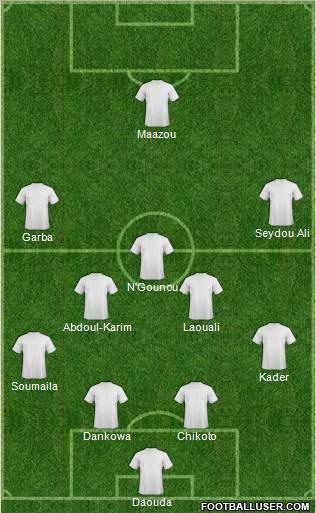 The composition of the midfield remains to be seen, but Issofou Boubacar Garba and Lassina Abdoul Karim should start; Garba will be on the left, Karim in central midfield. If he starts, William N’Gounou will be the most attacking of the midfielders and may even play a little closer to Maazou. It’s hard to envisage Niger being anything but whipping boys of Group B even though they have the right man at the helm. They should use this as another opportunity to improve their worldliness. There is a core of young players in the squad who should only continue to improve. The lack of resources at their disposal – they used an army plane to travel to the first leg of their play-off tie, with Rohr sitting next to the pilot – mixed with the unassuming club careers of the players makes returning to the Cup of Nations at the first time of asking an achievement itself. The gentle German is much-loved by those that cover African football, giving a lot of time to the press and even going as far as taking players whom he feels haven’t received enough credit to press conferences. Rohr played 350 games for Bordeaux before managing them in three stints, leading the side that included Zinedine Zidane to the 1996 UEFA Cup final. The Etoile striker can enchant and infuriate but has the pace and hang-time in the air to dismantle the very best on his day. He finished as the 4th top scorer in the Belgian league in 2008-2009 with 14 goals. He scored in both giant-killings of Egypt and South Africa, scoring the winner against the former. With his tireless running and flair down the flanks, Garba was unquestionably the best Nigerien performer last year. The Tunisian scouts must have been watching as Garba completed a move from Thai side FC Phucket to Tunisian giants Club Africain.